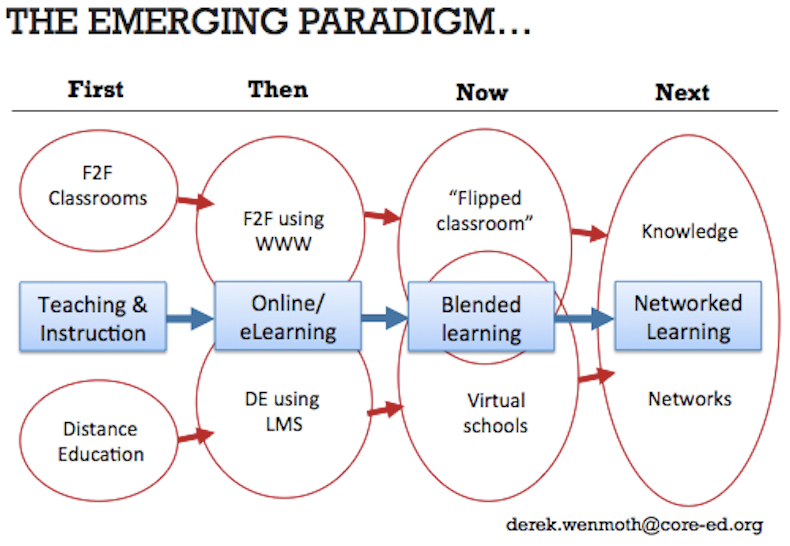 Derek's Blog | Musings on the use and impact of technology in education, and of the future of education in general. It was perfect timing to be reading this book – just as the ‘examination season’ is in full cry here in New Zealand (my youngest daughter has just completed being subjected to this for another year). The argument Rose makes in the book is that we need to “refocus on the individual within a crowd of averages”. It provides some deep insights supporting the concepts of personalisation, and learner agency – supporting the assertions of others like Seth Godin, Yong Zhao and Simon Sinek who have argued too for empowering choice and voice for learners. The book starts with an historical overview of where the concept of average came from, and how it has impacted on the thinking of human kind across all areas of endeavour over the past 200 years. Through this section of the book, Rose explains how this thinking, although well intentioned, is actually completely flawed and doesn’t serve the purpose it was intended at all. When thinking about schools we don’t have to look to far to see where the concept of ‘average’ has been used. Think of things like teacher student ratio, size of classrooms, student desks and chairs, periods in the school day etc. – not to mention the concept of standardised tests, intelligence tests, learning styles, personality types etc. Our traditional acceptance and continuance of all of these things come into question in light of what Rose reveals here. Jaggedness: – this involves looking at the various attributes and achievements that make up the whole person and understanding that the concept of ‘average’ actually masks a great deal of individual difference across a range of characteristics. Context: – acknowledging that individuals are likely to act and perform differently in different contexts, and therefore a label of ‘average’ isn’t likely to represent them in these different contexts. Pathways: – challenging the prevailing wisdom of things such as the standardisation of time and expectations, arguing arguing instead that there are many ways to reaching the desired outcome, and that the best path is a path just for us. Finally, Rose offers some examples of how this can work in practice. If you read The End of Average expecting to find a set of of answers written to guide teachers and leaders through a new way of being you’ll be disappointed. Rather, the book introduces a challenge, and sets the scene for disruption in the way we might think and act into the future. The point is that the answers aren’t actually there – yet. They will emerge as we engage with the challenging thinking that Rose introduces here, and then work collectively to imagine and develop new ways of working that will help us truly achieve the aspiration of helping every individual to live and learn purposefully. Learning to Thrive from EDtalks on Vimeo. I’ve been pondering lately about the complex change in society, and how now, more than ever before, it is important for us to place learning at the heart of our thinking in terms of how we address this. Studies have shown that lifelong learners – citizens who acquire new knowledge, skills and attitudes in a wide range of contexts – are better equipped to adapt to changes in their environments. If we want to achieve these sustainable societies with empowered citizens we need to do more than simply exist – we need to thrive! And learning is key! The video above is a summary of some of my thinking on this – highlighting the three key areas I believe are important for us to be focusing on as we work together to prepare our young people (and ourselves!) for this age of uncertainty. The annual uLearn conference is over for another year, and as the new term begins it’s worth taking a little time to reflect on the ‘big ideas’ we came away with — the overarching themes and messages that persisted through the various keynote, spotlight, and workshop presentations. I had the privilege of doing a quick summary at the end of this year’s conference, and want to share that in this blog post as an ‘aide memoire’ for those who are interested. The theme of change was overwhelmingly present in all of the keynote presentations. And not just any change — we’re talking exponential change. Change of such unprecedented proportion that it is becoming impossible to predict the future with any certainty at all, and where our ability to cope is severely challenged. The message was clear, we need to do more to understand the significance of this exponential change for our schools, our learners, and our society. It is time to recognise that our linear ways of dealing with change in the past are simply inadequate when it comes to preparing our young people for their future. As educational leaders, we are extremely well-versed in the linear approaches to change and change management. We settle in for months, and sometimes years, of sequential interventions designed to help us adapt to the latest change in curriculum, assessment, or pedagogical approach. The problem is that we’re constantly feeling like we’re ‘behind the eight ball’ and never achieving anything before the next wave of change is upon us. This is what happens when we attempt to respond to exponential change in a linear way. If there was one key message from each of our presenters, it was that we need to set aside many of our traditional approaches to change, particularly if we see ourselves as leading the change, or worse, managing it (now there’s an oxymoron). Linear approaches to change are premised on the notion of certainty — that by doing x and y in sequence we’ll end up in the changed state of z. The problem is, the world of exponential change is characterised by uncertainty — and that is a state that is almost impossible to manage in the traditional sense. Coping with uncertainty requires everyone involved to accept that they may not have the answers, and more importantly, to realise that the answer is more likely to reside with the collective rather than in the mind of a single individual (i.e., the leader). As educators, we need to move beyond seeing ourselves as the ones who are passing on our knowledge to our students, or even, facilitating them to discover that knowledge for themselves. We don’t have all of the answers, and the uncertain future our learners will face will present them with challenges that only they will be in a position to solve. This requires a level of humility in our actions as educators, and a growing emphasis on the development of competencies as distinct from domains of knowledge. As one of our keynotes observed; “I want my students to stand on my shoulders, to solve problems I/we can’t yet solve”. Through the conference we were repeatedly reminded to ask the ‘why’ question — to examine the beliefs that lie behind our actions, be they the things we do as individual educators, or the systems, structures, and processes we adhere to and defend with such vigor. Understanding how our beliefs shape behaviour is central to understanding how we can respond to change. 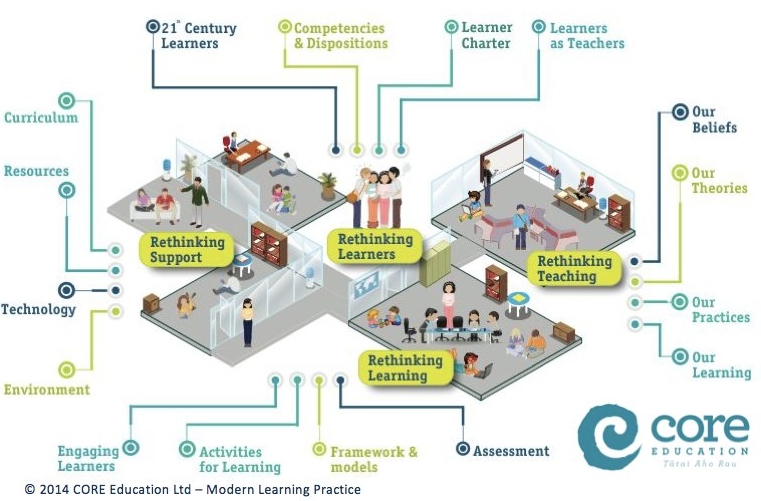 We see the impact of change in practice without the change in belief all too frequently in our current system — be that the move from single-cell classrooms into open, flexible learning spaces, or the adoption of new forms of assessment. Unless they are underpinned by a fundamental change in belief on the part of the educators involved, the change to some of these things will, just as quickly, be followed by a change back — ending up in the proverbial ‘ping pong’ we see in so many situations – from the school level through to the political level. Most importantly, we need to consider the notion of coherence — from our beliefs at the centre, the expression of these in terms of the values we espouse, to the practices that we engage in on a daily basis. If there is any inconsistency across these three ‘layers’, then we discover the fragility of any initiative we might engage in – however well intentioned it may be. This is where asking the ‘why’ question becomes so important. We need to be constantly reflecting on the beliefs that underpin our actions, as this is the only way we will build a unified view of the purpose and value of what we are seeking to achieve in our schools, our Kāhui Ako, and our system. If there’s one thing our education system isn’t easily disposed to embracing, it’s the notion of failure. We simply don’t have time for it. Having to deal with failure will simply hold us back from ‘covering’ everything we need to get through, or cause too big a gap to emerge between those who can and those who can’t. The big issue here is that we live in a time where innovation is being celebrated as something we need more of in our education system – we’re constantly being told how we need to encourage innovators and entrepreneurs in our schools, and yet, for these people, the one thing they have in common is failure. More than that, they have learned through failure. They understand how to confront failure and to learn from their mistakes. The secret is to heed the advice of ex-Saachi and Saachi CEO, Kevin Roberts, whose maxim is to ‘fail fast, fix fast, and learn fast’. In other words, don’t despair when things go wrong — use the opportunity to find a solution, and to ensure you learn from that so that you can avoid the same mistake in the future. If we are to succeed in coping with change in this exponential future, we need to make sure that our teachers and our learners are given permission to fail, and from that failure come to a position when they gain both success and insight as they turn their failure into an opportunity for learning. Finally – one more “F” word that was prevalent in our conference – FUN!! As educators, we can become overly serious at times – to the point of being morose, at times. Amid the excitement, the learning, the challenges of the conference, it was good to see people simply having fun! This is something we do well to recall as we return to the work we do on a day-to-day basis in whatever context we come from. If we lose the sense of fun, we lose an important ingredient in what motivates us to do what we do, and what attracts others to work and learn alongside us. I’ve just had the pleasure of being a part of an intensive two-day Deep Learning Lab in Christchurch with educators from the NZ schools involved in the global NPDL project. Final day keynote speaker was Kaila Colbin, a TEDx licensee, and NZ Ambassador for Singularity University. Kaila shared a compelling message about the impact of exponential change, explaining how our traditional, linear approaches to coping with change simply won’t cut it as we step forward into the future. Much of this change is can be seen in the area of technology, across all walks of life, from education, to transport, to health and so on. New Zealand current stands pretty well in this area according to the recently released Digital Evolution Index (DEI) from the Fletcher business school at Tufts University in Boston. This report is basically a digital pulse of 60 developed countries. The report is a data-driven holistic evaluation of the progress of the digital economy across 60 countries, combining more than 100 different indicators across four key drivers: Supply Conditions, Demand Conditions, Institutional Environment, and Innovation and Change. It segments the 60 countries into Stand Outs, Stall Outs, Break Outs and Watch Outs. New Zealand is one of three countries are notable as standouts even within the Stand Out segment, the others being Singapore and the UAE. The report identifies these three as having a unique policy-led digital strategy and a narrative that may be considered by other nations as worthy of emulation or adoption. This is great news for New Zealand, and credit to the many innovators and risk takers in our midst who have stepped out and created opportunities to develop new products and services that utilise these technologies. It’s also a testament to the many businesses, tertiary providers and schools that provide opportunities for staff/students to pursue their interest in digital technologies – and gives weight to the argument for a digital technologies curriculum I can hear some say. Herein lies the crunch. The biggest challenge, according to this report, will inevitably come from the group of countries in the Break Out category – those that are low-scoring in their current states of becoming digital but are evolving rapidly. According to the report key Break Out countries that have the potential to become the Stand Out countries of the future are China, Malaysia, Saudi Arabia, Kenya, and Russia. Which brings me to the point of my reflection. Our continued success in this area will require a substantial amount of effort and focus if we aren’t to be overtaken. In our schools this means a significant change in emphasis in the way we think about the ways we teach about, with and through digital technologies, for while the evidence at the ‘output’ end is currently encouraging, the evidence of what is happening for the next generation of digital expertise in NZ isn’t as hopeful. Rachel Bolsted’s recent research published by NZCER paints a picture of increasingly focused use of digital technologies to support both student and teacher learning, but falls well short of being convincing that the sector really has a grasp of the significance of the exponential nature of the change afoot. The latest OECD report on Students, computers and learning paints a similarly concerning picture, highlighting across all countries involved that while teachers say they value 21st century pedagogies their practice doesn’t reflect that. In several of the cross-country comparisons in this report, New Zealand appears close to or below the OECD average. The issue here is about the pace of change, and the fact that we cannot afford to maintain an approach based on our traditional ‘linear’ models of change management and approaches to PLD. While NZ may be able to celebrate having a high level digital strategy approach as identified by the DEI, we have to ensure this is being exploited fully at the everyday level in our schools and kura, and taken advantage of to ensure that our young people are given the opportunity to grow fully as innovators, design thinkers and digitally fluent young people. This is not about simply focusing then on developing a greater number of coders or computer engineers (as necessary as those skills may be) – but must focus on building the capabilities and contribution of a wide range of people, that includes the coders and engineers, but also the writers, communicators, designers, artists… building and creating multi-disciplinary teams for whom collaborative activity comes naturally, and where the principles of design thinking strategies guide their involvement. This revolution is already in homes across the developed world and increasingly in the developing world too. And there, it is transforming the way children and young people play, access information, communicate with each other and learn. But, so far, this revolution has not transformed most schools or most teaching and learning in classrooms. Amid the barrage of new initiatives, assessment demands, achievement challenges and the like it’s sometimes difficult to lift your eyes to a horizon that’s focused on the greater purposes of education, with the long-term good of young people at it’s heart. This is why I’m really proud to be a part of a global collaboration headed by Michael Fullan and his team called New Pedagogies for Deep Learning. With participation from schools in the USA, Canada, Finland, Uruguay, the Netherlands, Australia and a growing number of schools here in New Zealand, this project is successfully helping teachers, schools and school systems to build knowledge and practices that develop deep learning and foster whole system change. The programme has been going for a little over three years now, and is gaining traction through the sharing of experiences and research that demonstrates what is effective in creating these rich and deep learning experiences for our young people. Educators are provided with a suite of tools to help them plan for, assess and evaluate programmes that enable deep learning to occur, and connect them to a global community where these experiences are shared and explored further, allowing insights to develop that transcend the limitations of specific country contexts. Regular Deep Learning Labs are held in various parts of the world where these experiences are shared and the latest insights and knowledge are explored further. We’re holding on in Christchurch, New Zealand on 20-21 July this year where we’re looking forward to sharing with the growing number of teachers from NZ and Australia who are participating. Kaila Colbin is a keynote speaker. Fresh from her participation in last year’s SingularityU event in Christchurch, Kaila has some challenging perspectives on the future where exponential growth of technology offers exciting opportunities to disrupt education. I’d welcome inquiries from anyone who may be interested in attending – this is a unique opportunity to find out more about this global collaboration and how you can be a part of it! I’m currently attending the ConnectED conference of principals in the Newcastle region in Australia, exploring the theme of professional learning communities and enjoying hearing from speakers with a wealth of experience in this area including Alma Harris, Michelle Jones, Helen Timperley and Peter Goss. A constant theme in the presentations and workshops is change, and how, as educational leaders, we need to be disciplined in the ways we work with teachers to embrace and deal with change, empowering them through the process of inquiry and professional learning groups. Many times in the discussions with secondary teachers in particular the challenge of providing quality instruction in specific curriculum areas has been raised as one of these issues. Today I read the article in the NZ Herald titled Secondary schools facing a ‘perfect storm’ as teacher shortage deepens that reports on the issue of high school students are being taught maths and science by teachers without specialised skills as schools struggle to fill gaps created by a worsening teacher shortage. The article quotes Secondary Principals’ Association president Michael Williams: “Schools were making do, but students were not getting the scope of curriculum they deserved. For instance, he had heard of one school dropping its robotics course in the senior school because the principal could not find a teacher to take it.” Sadly, making do isn’t good enough if you’re the student lining up for your ‘one chance’ to receive a quality secondary education in year 12 or 13! The problem isn’t simply one we face in NZ. In his keynote speech at the COBIS Conference 2017 Mark Steed highlighted the growing problem of supply and demand of schooling worldwide and examined how technology and innovation may provide solutions to teacher shortages and a growing population. To illustrate his point he highlighted the statistic that 28 per cent of Physics lessons in the UK are not taught by a qualified Physics teacher. I’m sure there’d be similar statistics available if we were to explore the current situation in NZ schools in depth. The Herald article quotes several education leaders expressing very valid concerns about the impact of this on our learners, and includes reference to the Minister of Education, Nikki Kaye, who has announced funding and new initiatives this week to help boost the numbers of quality teachers. This is all very good and commendable, and will hopefully go some way towards addressing the issue at hand. I have believed for as long as I can remember in an afterlife within my own life–a calm, stable state to be reached after a time of troubles. When I was a child, that afterlife was Being Grown Up. As I have grown older, its content has become more nebulous, but the image of it stubbornly persists. Schön takes it as a given that things will never settle down. The appropriate response to any change, in his view, is to understand it, not to fight it or even to surrender to it: “The task which the loss of the stable state makes imperative, for the person, for our institutions, for our society as a whole, is to learn about learning”–to become capable, in other words, of making continual transformation a given rather than reacting to it as an anomaly. This is where using inquiry as part of a collaborative process of ‘inventing the future’ becomes important – not to ‘fill the void’ until things return to normal, but to give effect to that continual transformation. I believe this is the case with our ‘perfect storm’ in the teaching profession. It’s not a case of putting in a number of measures in the hope that things will ‘settle down’ and return to ‘normal’ (whatever that is). The fact is that the very foundations of our education system have been and are being changed. It is unlikely that we will ever be able to provide the numbers of specialist teachers required – most certainly not if we expect every school to have a full quota of them, especially in our rural and remote schools. I agree with Mark Steed that innovation is the key to tackling these problems, and that disruptive technologies will play a part in this – although I am less enamoured with his idea of education being offered at three price points according to preferences such as class size, facilities and the qualification of teachers! 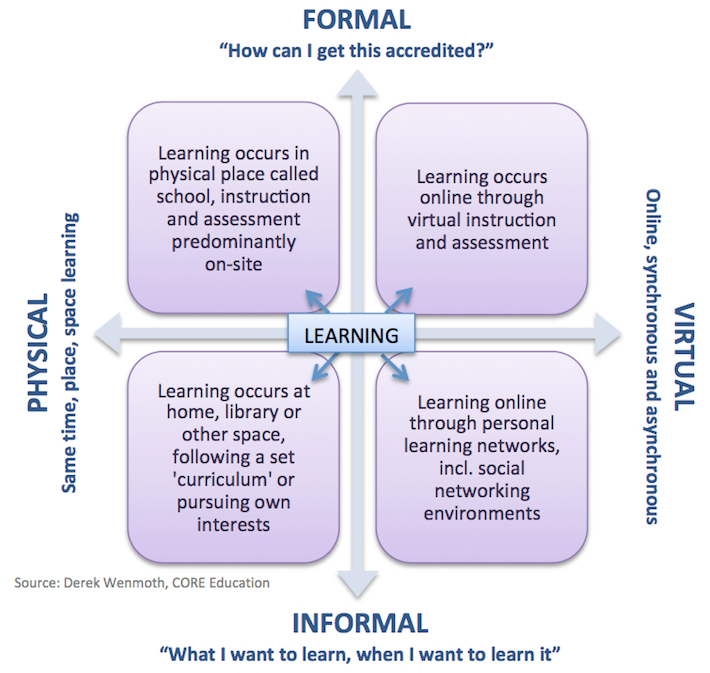 For me the future lies in the sorts of innovation that we are already seeing in some areas, including the Virtual Learning Network that has been brokering connections between skilled teachers and students for nearly twenty years now, as well as the sterling work of Te Kura (The NZ Correspondence School) that caters annually for approx. 10,000 dual enrolled students. These very successful approaches, although not widely acknowledged as significantly as programmes offered in traditional, face to face schools, do cater for the preferences and interests of students first and foremost, allowing many to access their first choice subject options where otherwise they’d be denied. To face the future we must accept that the stable state is simply an illusion, that things won’t ‘settle down’ once we’ve put a few temporary measures in place, just to tide us over! As educational leaders we need to be more courageous, more visionary and more disciplined in our efforts to create the future that will ensure our students get the education they deserve and that the issues of equity and quality aren’t lost in the process. I’m sorry, but “making do” simply isn’t good enough! What if all of this really is true?? In the 19th century the Industrial Revolution created a huge urban proletariat, and socialism spread because no other creed managed to answer the unprecedented needs, hopes and fears of this new working class. Liberalism eventually defeated socialism only by adopting the best parts of the socialist program. In the 21st century we might witness the creation of a massive new un-working class: people devoid of any economic, political or even artistic value, who contribute nothing to the prosperity, power and glory of society. This “useless class” will not merely be unemployed — it will be unemployable. This morning I spent some time reading and reflecting on a challenging article I came across by Yuval Noah Harari titled “The Rise of the Useless Class” in which he asserts: “just as mass industrialization created the working class, the AI revolution will create a new un-working class” – a group he calls the ‘useless class’. This is challenging stuff, and not entirely palatable for those of us who are ‘long in the tooth’ and concerned now about the future for our kids and grandkids. The central tenet of Harari’s thesis is that what we do as humans is the product of organic algorithms (occurring in our brains and consciousness), and that eventually these can, and will be replaced by the non-organic algorithms of machines and artificial intelligence. Of course, Harari isn’t the only person speaking about such change. In 2015 Darrell West of the Brookings Institute wrote about the impact of emerging technologies on employment and public policy in which he cites computerized algorithms and artificial intelligence as key influencers of this change. West argues as one of the solutions we should consider the establishment of activity accounts for lifetime learning and job retraining. This is not the first time I’ve felt confronted by bold predictions about the future. Back in the 1970s when I was training to be a teacher we were encouraged to read Alvin Toffler’s Future Shock, much of which I’ve seen come to pass in my 40 year career. While my peers and I might have read the material, very few of us (myself included) took these predictions as seriously as we might, and soon found ourselves immersed in the culture of schools and teaching of the time, finding little opportunity (or need) to actively pursue new ideas and approaches in our practice. For me that came later in my career! While I’m sure there will be many others besides Mnuchin who have a similar ‘optimism’ that nothing will change (or if so then very slowly), there are indeed plenty of signs that they indeed are. And if this is the case, then we need to be concerned about how best to prepare ourselves. This is the question that Liam Dann responds to in an excellent article in the NZ Herald titled “how to prepare your kids for the robot revolution“, in which he explores whether they will kill our jobs, and how we can future-proof our children. What if we were to take this challenge seriously – and I mean, really seriously?? Since we do not know how the job market would look in 2030 or 2040, today we have no idea what to teach our kids. Most of what they currently learn at school will probably be irrelevant by the time they are 40. Traditionally, life has been divided into two main parts: a period of learning, followed by a period of working. Very soon this traditional model will become utterly obsolete, and the only way for humans to stay in the game will be to keep learning throughout their lives and to reinvent themselves repeatedly. How might we reconsider our models of school and schooling? How might we reconceptualise our thinking about curriculum and assessment? What about our pedagogical practice – who teaches who and how? What will be the role of teachers – and who will those teachers be? What emphasis needs to be on things like citizenship, ethics and equity – alongside the development of job-ready skills? These questions have been asked for as long as I’ve been a teacher – but our schools and schooling system remains largely the same as when I started. Sure, there are now more computers being used, a number of walls have been knocked down between classrooms and vogue terms such as learning styles and personalised learning have entered our vocabulary, but for the most part these are what I call first level changes (where the change takes place within accepted boundaries and leaves basic values unexamined and unchanged). If the challenges presented by Harari and others are really true, then perhaps we need to be actively pushing at the boundaries of existing practice and examining the assumptions that influence first order thinking (second level change). Then we need to push on to develop a deep understanding of alternative world views and ways of doing things, seeking change that is transformative – for both individuals and the whole of society (third level change).